JAPANESE IMMIGRANTS who came to Oregon in the early 1900s stayed connected with one another and the rest of the world by reading the local Oshu Nippo newspaper. The all-Japanese daily was published out of its headquarters at Northwest Second Avenue and Davis Street in the old Merchant Hotel building, which was the heart of Northwest Portland’s Japantown. Now, for the first time, Oshu Nippo is being translated into English. The newspaper began in 1908 under its former name, The Oregon Shimpo (Oregon News). A major Japanese labor contractor and general store owner, Shinsaburo Ban, dispatched immigrants to jobs all around the West and needed a way to keep in contact with them. “He thought, ‘We need a way to publicize jobs and recruit people,’” said Lucy Capehart, director of collections and exhibits at the Oregon Nikkei Endowment, which is heading up the Oshu Nippo Translation Project. “He was a labor broker and was in charge of communications for that." Ban left the newspaper business a year later and was replaced by Toyoki Abe, who changed the name of the paper to Oshu Nippo. Six years later, it changed hands again when the new editor and recent graduate from a Tokyo journalism school, Iwao Oyama, took over and then stayed for 34 years. Oyama was the head writer, and he hired a teacher from a Japanese school in Southwest Portland to help with assignments. In one article from 1918, a Shamisen teacher described first arriving at the Port of Seattle 10 years earlier. In another article from 1923, Senichi Tomihiro wrote about Japanese-Americans’ civil rights. “Some people think because of previous lost cases of citizenship litigation, Japanese residents would lose their U.S. citizenship. ... This is a misunderstanding,” he wrote. “All persons born or naturalized in the United States and subject to the jurisdiction thereof, are citizens of the United States and of the state wherein they reside,” he explained. Capehart said Oshu Nippo photographs were included in a book the immigrants sent back to Japan to persuade more people to make the trip. “It shows farms, what the city looked like, logging … all to promote the city and let the Japanese know what was happening and why they should come,” she said. The Oshu Nippo also had plenty of lighthearted fare, including feedback from readers on their favorite hobbies – billiards, cards, haiku, reading the encyclopedia, watching local sports – and their favorite foods including sushi, soup with rice cakes and vegetables, and amazake sweet drink made from fermented rice. Photographs of local sports teams also were a common feature. 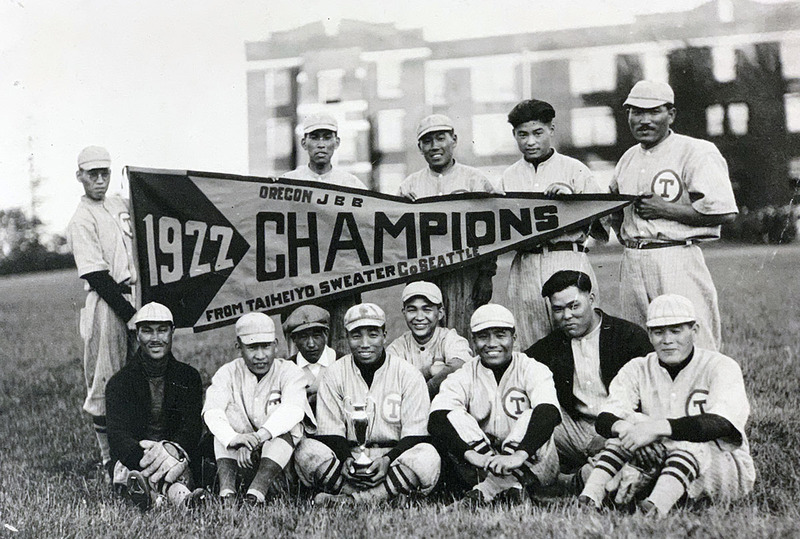 This sports team photo was featured in an issue of Oshu Nippo, a Japanese newspaper in Portland. One of the biggest challenges for the Oshu Nippo staff was the arduous task of printing. The newspaper relied on a team of about 10 female type-setters who tediously arranged thousands of old Chinese characters in a system of Japanese writing (kanji) for each day’s edition. Now, a century later, another laborious task: translating 300 pages of the Oshu Nippo to English. A researcher who was studying Japanese food happened upon some of the newspaper’s scans at a library in Chicago and suggested the translation project to the Oregon Nikkei Endowment. With a generous grant from the Oregon Heritage Commission, Fuchigami Parks and her team got started. “We had to translate from old Japanese, to modern Japanese and then to English,” Fuchigami Parks said. They needed volunteers who could read the old-style characters. Fuchigami Parks said local volunteers were helpful since they were familiar with the community names and could verify their proper translation. But still, the project needed more help. Translator Yoko Gulde, who retired from the law firm Lane Powell, was the key to getting the project off the ground. Along with coordinating translators offered by Lane Powell, Gulde used her connections with the Portland-Sapporo Sister City Association to find nearly 100 Japanese volunteers overseas. The entire team translated 10 editions of Oshu Nippo of varying lengths. The project is now in the proofreading stage. Fuchigami Parks and Capehart believe this is the first time anyone has attempted the translation. One thing you won’t find in the translation of Oshu Nippo is reaction to the beginning of World War II. That’s because in 1941, when Pearl Harbor was attacked by the Imperial Japanese Army, the FBI almost immediately seized the newspaper’s printing press and arrested its editor, Oyama. The U.S. government forced Japanese families to move into concentration camps surrounded by barbed wire and armed guards for three years. Even after the long absence, the Oshu Nippo re-emerged after the war as an English-language newspaper printed by mimeograph. The Oregon Nikkei Endowment’s goal for the Oshu Nippo Translation Project is to post the 300 pages in both English and Japanese on its website for researchers and the general public. It also intends to print some hard copies for public viewing. The endowment is organizing a reception to celebrate its completion, which will include the key players from the project.